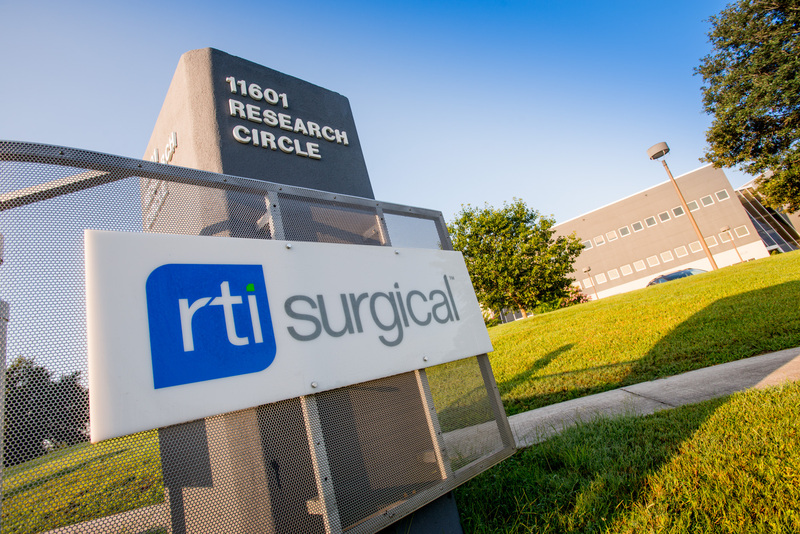 RTI Surgical® Announces 2017 Third Quarter Results - RTI Surgical Holdings, Inc.
ALACHUA, Fla. (November 2, 2017) – RTI Surgical Inc. (RTI) (Nasdaq: RTIX), a global surgical implant company, reported operating results for the third quarter, ended September 30, 2017. RTI generated $66.7 million in revenue, driven by growth in the company’s spine, commercial and international businesses. Earnings for the third quarter totaled $16.5 million, which includes a $34.1 million gain from the sale of RTI’s Cardiothoracic closure business, which was announced on August 3, 2017. During the quarter, three highly experienced executives were added to the leadership team: Jonathon Singer as chief financial & administrative officer, Olivier Visa as head of OEM, Donor Services and Sports franchises, and Julius Aviza as leader of the quality assurance function. RTI’s revenues for the third quarter of 2017 were $66.7 million, a slight increase from the prior year quarter revenues of $66.5 million. Third quarter revenues were driven by growth in spine, commercial and international, partially offset by a $1.6 million reduction from the sale of substantially all the assets of the Cardiothoracic closure business. In addition, RTI estimates that the impact of domestic hurricanes during the quarter reduced revenue by approximately $1.2 million due to cancellation of procedures. Gross profit for the third quarter of 2017 was $33.5 million, or 50.3% of revenue, compared to $34.3 million, or 51.5% of revenue in the third quarter of 2016. Gross margin was impacted adversely by approximately $0.9 million in the third quarter of 2017 due to the loss of revenue and the closure of RTI’s Florida facilities due to hurricanes during the period, and by $1.3 million due to the sale of the Cardiothoracic closure business. During the third quarter of 2017, RTI completed the sale of substantially all the assets related to its Cardiothoracic closure business for total consideration of $54 million, plus an additional $6 million in contingent cash consideration. In conjunction with the sale of the Cardiothoracic closure business, the company recognized a gain of $34.1 million, or $18.2 million after-tax. During the third quarter of 2017, RTI incurred $2.8 million in severance charges predominantly to support executive leadership transition and our efforts to enhance our strategic focus to reduce complexity and drive operational excellence. Net income applicable to common shares was $16.5 million, or $0.23 per fully diluted common share in the third quarter of 2017, compared to a net loss applicable to common shares of $4.5 million, or $0.08 per fully diluted common share in the third quarter of 2016. As outlined in the reconciliation tables that follow, excluding the impact of the Cardiothoracic closure sale gain and severance charges in the third quarter of 2017, adjusted net income applicable to common shares was $0.4 million, or $0.01 per fully diluted common share in the third quarter of 2017. Adjusted earnings before interest, taxes, depreciation and amortization (Adjusted EBITDA) of $8.1 million was comparable to the third quarter of 2016. RTI has developed its guidance based on the company’s ongoing restructuring and operational improvement program, its current business profile and existing market conditions. Within this context, based on third quarter 2017 results and the transition of the Cardiothoracic closure business from a direct business to a commercial business due to the sale, RTI continues to expect full year revenues for 2017 to be between $274 million and $280 million. Due primarily to the third quarter impact of the hurricanes, RTI has narrowed the guidance range for adjusted full year net income per fully diluted common share to be between $0.05 and $0.07 based on 61 million fully diluted shares outstanding when adjusted for non-recurring activity as detailed in the reconciliation provided below. RTI will host a conference call and simultaneous audio webcast to discuss its third quarter 2017 results at 8:30 a.m. ET today. The conference call can be accessed by dialing (877) 383-7419. The webcast can be accessed through the investor section of RTI’s website at www.rtix.com. A replay of the conference call will be available on the RTI website following the call. Full year net income per fully diluted common share is expected to be in the range of $0.21 to $0.23, based on 61 million fully diluted shares outstanding. Excluding severance charges and the gain from the sale of the Company’s Cardiothoracic closure business taken in 2017, full year net income per fully diluted common share is expected to be in the range of $0.05 to $0.07. Severance charges – This adjustment represents charges relating to the termination of former employees. Management removes the amount of these costs from our operating results to supplement a comparison to our past operating performance. Restructuring charges – This adjustment represents the closure of our French distribution and tissue procurement office. Management removes the amount of these costs from our operating results to supplement a comparison to our past operating performance. Strategic review costs – This adjustment represents charges relating to a comprehensive strategic review of the Company’s business lines and operations intended to leverage the Company’s expertise, technology and products and identify opportunities to increase stockholder value. Management removes the amount of these expenses from our operating results to supplement a comparison to our past operating performance. CEO Retirement and transition costs – This adjustment represents charges relating to the retirement of our former Chief Executive Officer, and the resulting financial impact of such resignation under the Executive Transition Agreement dated August 29, 2012 and Executive Separation Agreement dated August 15, 2016. Management removes the amount of these expenses from our operating results to supplement a comparison to our past operating performance. Gain on Cardiothoracic closure business divestiture – This adjustment represents the gain relating to the sale of substantially all the assets of our Cardiothoracic closure business to A&E. Management removes the amount of this gain from our operating results to supplement a comparison to our past operating performance.